Electric bikes are hardly news anymore, but some designs stand out as truly ahead of the pack. 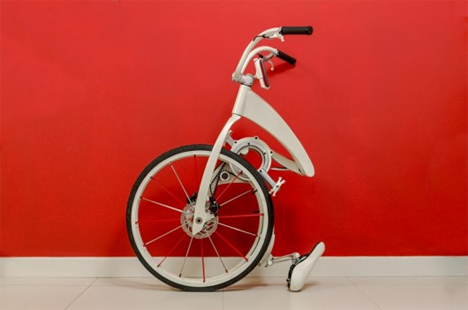 The Gi Bike has changed the e-bike game with a bike that is lightweight, folds easily, and includes enviable connectivity and safety features. 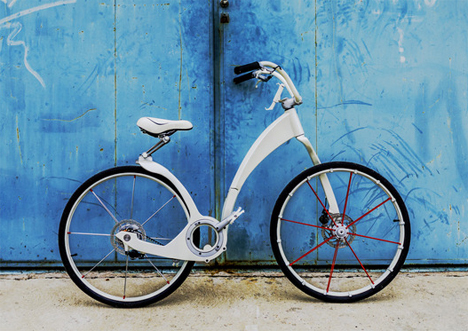 The Gi Bike is the “perfect city bike,” according to the company behind it. They integrated all of the features that they wanted to see in a bike to create a mode of transport that is not only safe and speedy, but stylish as well. Weighing in at just over 37 pounds including the LiFePo4 battery, the Gi is one of the lightest e-bikes to be introduced to the public. It can ride for more than 40 miles on a single charge, making it ideal not only for commuting, but for those long leisurely rides as well. A smart anti-theft lock is integrated in the front and rear wheels, locking the bike and making it unusable when the owner (and his/her smartphone) moves more than 10 feet away. Toothed carbon drive belts mean fewer breakdowns and a safer ride. Built-in smart LEDs on the front and rear wheels turn on when it starts to get dark, making the Gi even safer. The Gi app connects you to friends, giving it a social networking personality. 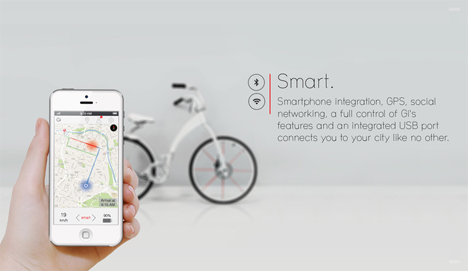 Friends can request the use of your bike and you can respond instantly. An integrated USB port and smartphone mount let you plug in your phone to help you navigate or communicate. And when you get to your destination, a single motion folds the bike in less than three seconds. If you aren’t interested in the electronic part of the bike, the company has also designed a pedal-only version. The prices for both versions are, at publication time, still to be announced. See more in Bikes & Cycles or under Transportation. June, 2014.